The S.I. Newhouse School of Public Communications will host the premiere screening of “Garwin,” a film by Professor Richard Breyer and alumnus Anand Kamalakar G’95, on Thursday, March 27, at 7 p.m. in Heroy Auditorium. Walter Montgomery ’67, CEO and partner with Robinson, Lerer and Montgomery LLC, is executive producer. Garwin is a physicist who, among other accomplishments, was the author of the actual design used in the first hydrogen bomb in 1952. 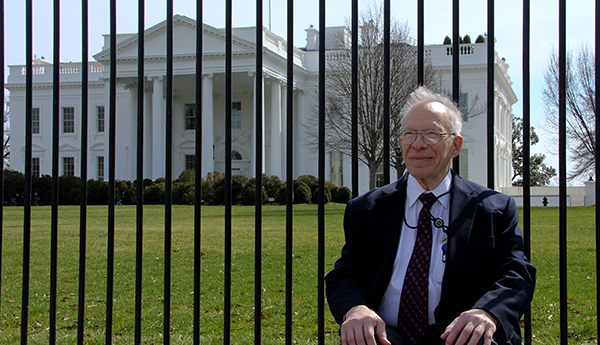 He received the National Medal of Science in 2002. Enrico Fermi, in whose lab he worked, said Garwin was the only true genius he had ever met. The filmmakers traveled across the country with Garwin—from IBM headquarters in New York City to Washington, D.C., to Los Alamos, N.M., to La Jolla, Calif.—and even to Europe. Following Garwin as he searches for what it takes to build a more peaceful, verdant and sustainable world, and examining issues such as global warming, nuclear proliferation, disarmament and the energy crisis, the film explores the rich and controversial career of a man whose name is little known but whose impact on the 20th and 21st centuries has been remarkable. Breyer is co-director of documentary film and history, a joint master’s degree program offered by the Newhouse School and SU’s Maxwell School of Citizenship and Public Affairs. Kamalakar is founder of Trilok Fusion Media in Brooklyn. Their first collaboration, “300 Miles to Freedom,” was released in 2011. The event is free and open to the public. A reception will follow. For more information, contact Breyer at 315-443-9249 or rlbreyer@syr.edu.